To correctly add multiple subnets in Sofros LAN Messenger, it is necessary to understand how each instance of the application builds its user list. First, one instance of Softros LAN Messenger sends a UDP packet to the LAN broadcast address. It calculates the address based on the IP address and subnet mask of the computer it is running on. Any packet sent to a broadcast address is received by all LAN computers. After receiving the packet, other instances of Softros LAN Messenger running on the network respond with a TCP packet sent to the sender’s address. As a result, the sender instance receives the packets from the other instances and, based on their responses, builds its user list. This technique is used by all instances running on the network (sending one packet to the broadcast address and receiving responses from the other instances). Thus, Softros LAN Messenger works within one subnet without any additional configuration. The task of getting Softros LAN Messenger to work across multiple subnets involves delivering to another subnet that first packet sent to the broadcast address. 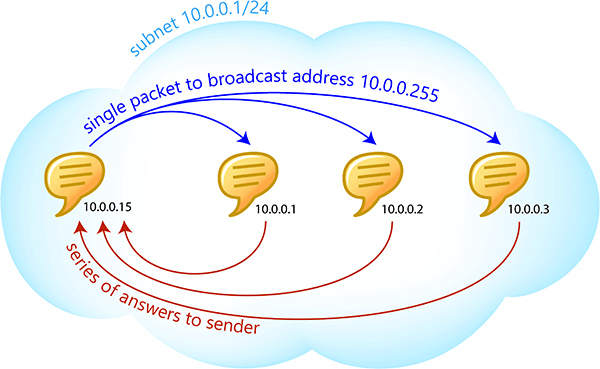 Each subnet has a unique broadcast address. It is impossible for an instance from one subnet to calculate the broadcast address of another subnet without having any information about it. This is why the broadcast address of the other subnet needs to be added to said instance’s Broadcasts list. This way the instance will be able to send the packet, having received which, instances from the other subnet will be added to its user list. To add a subnet to the Broadcasts list, follow these steps. On the Network tab in the Settings dialog box, click Add. In the dialog box which appears, select an option serving best for your network (Single IP/broadcast address, Subnet info, IP address range), fill in the text boxes below depending on your selection, and then click Add. 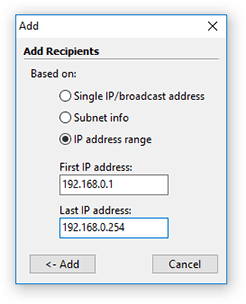 Single IP/broadcast address. Used when you know the broadcast address of a remote subnet or when you want to connect a single computer rather than a subnet. Subnet info. Most widely used way of connecting a subnet. All you need to do is add the IP address of any computer from the subnet and the subnet mask. Based on this data, Softros LAN Messenger will calculate the broadcast address of the subnet and use it for building the list. IP address range. Used if subnet routers do not allow packets to broadcast addresses, or if subnets are connected through a VPN tunnel, which never allows packets to broadcast addresses. Here you need to add a range of IP addresses of the computers from a remote subnet where Softros LAN Messenger is running. This option to a degree increases cross-subnet traffic. When using DHCP, it is recommended that you narrow the DHCP pool to try to match the actual number of computers. This will help narrow the IP address range added in the Broadcasts list, which, in its turn, will prevent excessive traffic. For consistent operation, Softros LAN Messenger needs to be configured on both subnets; one subnet should add the other and vice versa. Click here to get your IP address and subnet mask. To work with multiple subnets, Softros LAN Messenger requires a direct TCP connection between computers. Particularly, the application will not function with NAT enabled. To check for the required connection, run the diagnostic utility Ping using the IP address of a remote computer. It is important that you do this test in both directions.